This topic contains 38 replies, has 3 voices, and was last updated by towhid 3 years, 8 months ago. Ok firstly i am getting frustrated here with never-ending errors and i think i am not alone here. firstly i have upgraded thinking the changes promised will be sorted. Which have not. I AM WASTING ALOT OF TIME IDENTIFYING ERRORS SINCE I HAVE PURCHASED THIS PLUGIN. this should not be the case when we are wasting our time and money. i expect a complete product. 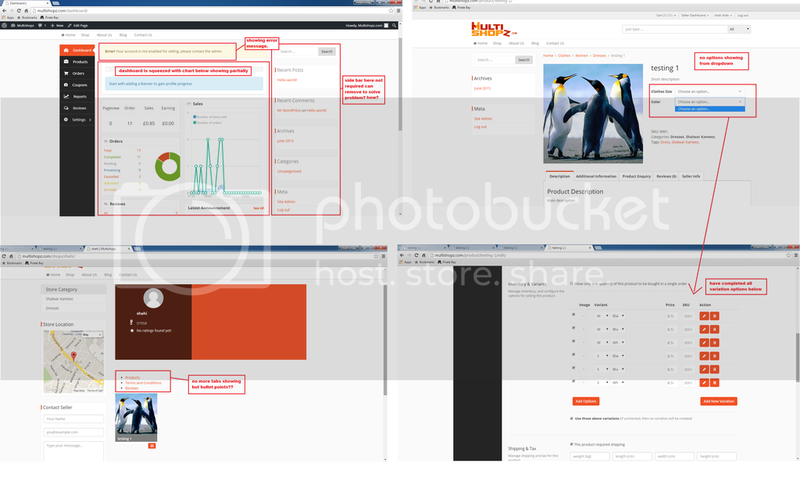 ok the issues are self explanatory in the image below (4 screen shots). Also other problems: seller login still takes me to the shipping address and not dashboard by default. i want this resolved as im not going to sit here and send/ recieve message. If you cannot help then i suggest you refund me fully + my time wasted! Thank you. 1- Need my site configured as was part of installation service. Including side bars like your demo. Frontend and seller admin. 2- Licence error also showing. 3- Store page issue needs sorting. 4- Login redirected to wrong page. 5- show step by step how to create a product variation? You have my login details and when can I expect this all completed and ready?? 1. Can you please check the dashboard of the site. I have removed the right sidebar of the dashboard like the demo. 2. When a seller registered as a seller please enable the “New Seller Enable Selling” option from Dokan->Settings->New Seller Enable Selling, then a seller will not get that kind of error message. 2. Please contact with us by using this contact form- http://wedevs.com/contact/. You have to select the question type as- “License activation problem”. We will solve your license issue as soon as possible. 3. I can see there are no bullet points for Products, Terms and Conditions and Reviews. Here is the screenshot. . Can you please check once again this point. 4. I have reproduced this issue and got that login does not redirect to a dashboard page. I have to discuss this issue with our developer team. Please allow me some time. 5. Please check this documentation through this link – http://docs.wedevs.com/creating-products/#variable-product. It will let you know how to create a variation for a product. You can also read from the beginning (Creating a product). Also everytime i click from another page to the homepage- there is a distortion in format- the product image goes big and then normal- this should not happen. i have tested with internet explorer and google chrome. Please sort this out and it only seems to affect the home page. 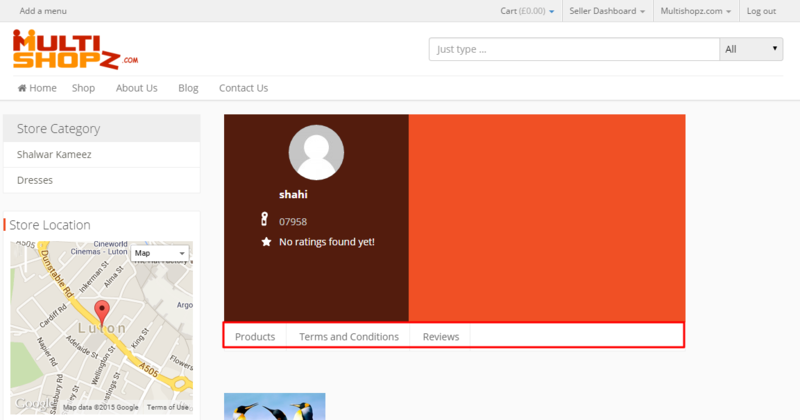 My product variation is STILL not working- i have checked the support link you have given in your previous post which shows in tab view and it is different. In the flat view i have enabled as shown on screenview at my first post (above). Check my website and see for yourself i have followed as required- My login details are above. I totally agree with Mubasher with constantly updating the plugin instead of solving problems for hundreds of websites. A lot of issues that I encounter since day 1 of installing the plugin are not due to installation problem, most of them are due to the plugin itself. Also, we paid for the plugin in order to get at least a basic working system instead of wasting time troubleshooting it. Please allow me some time. I will reproduce this issue and let you know the result. Hello Towhid I'm waiting impatiently so please hurry. Time is what I don't have.! Kenneth glad you understand where I'm coming from. I can see the support team are trying their best to help but I feel they don't have the right processes in place. No sense/ logic updating a correction in 100 websites when just do it in the source plugin and just get clients to update the plugin. i guess this should be for another thread. 2. Now, check yourself and let me know that login redirect is working. 3. I did not understand this line. Please attach a screenshot. 1- if you look at my screenshot I have added price for variation- check my website before replying what I already showing you. Need to check what the issue is. 2- yes this is solved now thankyou. Redirects to dashboard. 3- will send you a screenshot. 1- Product Variation- i have discovered a bug- once you add the product variation and add price against each variation it saves the price but does not enable Product variation until you select each ‘action' button against each product and save it. which i think is a very long process because of the bug. please look into this and correct it. 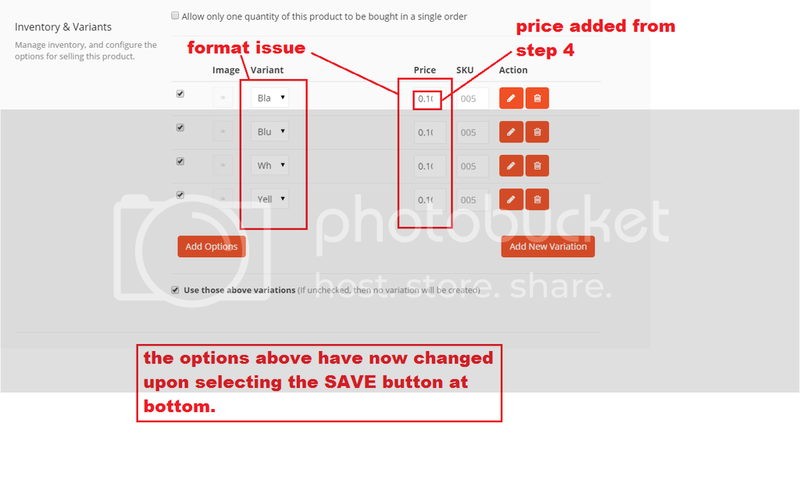 the second image is where i had added the price but does not enable until i click on each variation and then click on save.– needs to be fixed. 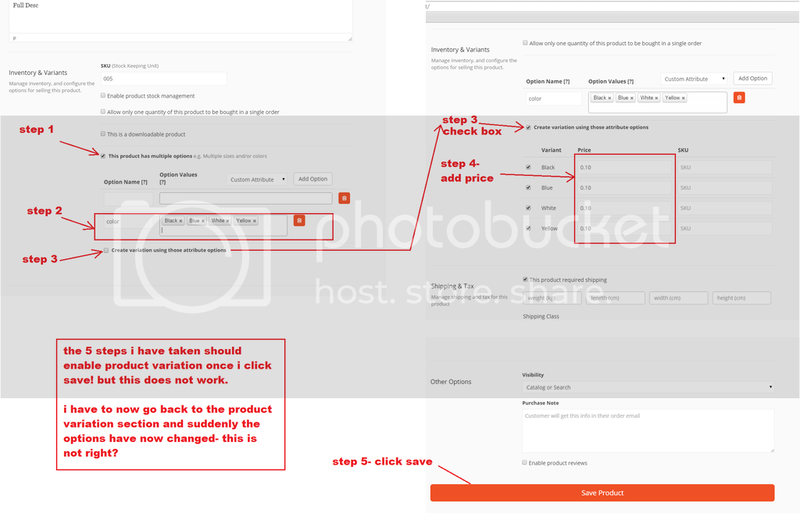 Also the pricing text boxes in the above image for product variation are so small you cannot enter full amount as you can see-this also needs correcting to make it bigger. I think you are misunderstanding the idea about the variation product. It is not a bug to add each variation product and its price individually. If there is no feature like this then that does not mean- it is a bug. If you get any error while sets detail in the product then you can tell us we will fix it surely. 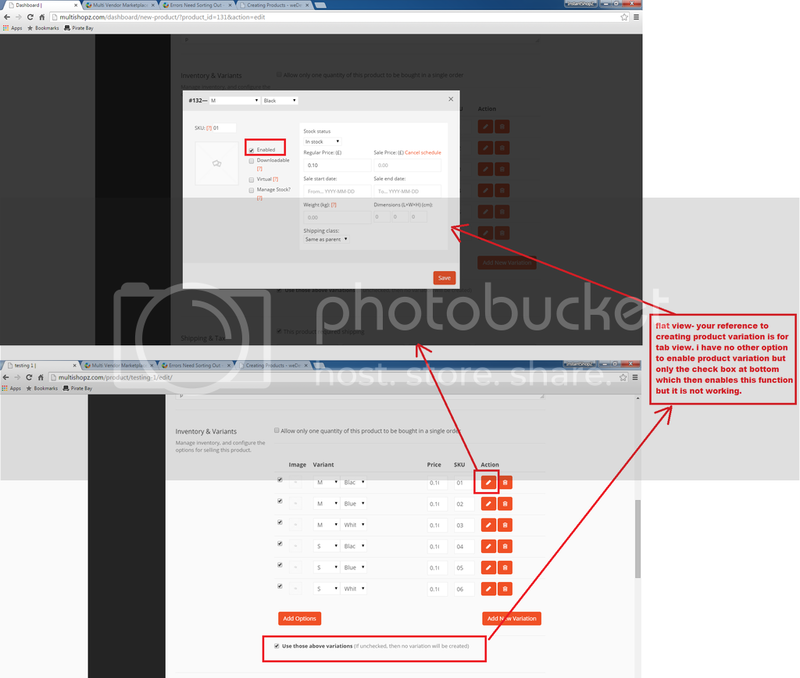 To avail this kind of addition you have to customize the plugin. If you need this feature very urgently you can hire a developer you can do the customization on your own if you know how to do programming. i think you have misunderstood what i am trying to say. i know what product variation means and what it is capable of. The above screen you will see has formatting issues (NEEDS CORRECTING) and now only it will enable Product Variation when selecting the ACTION button against each variation. The topic ‘Errors Need Sorting Out’ is closed to new replies.